Insiders are fearful of an impending sell off. When this happened earlier this year the S&P 500 quickly declined 10%. Other sentiment measures are reaching extremes too, but there’s a silver lining. All major U.S. stock indexes continue to trade near multi-year highs, but insiders are selling stocks of the companies they own or manage at a pace not seen at any other time in 2012. 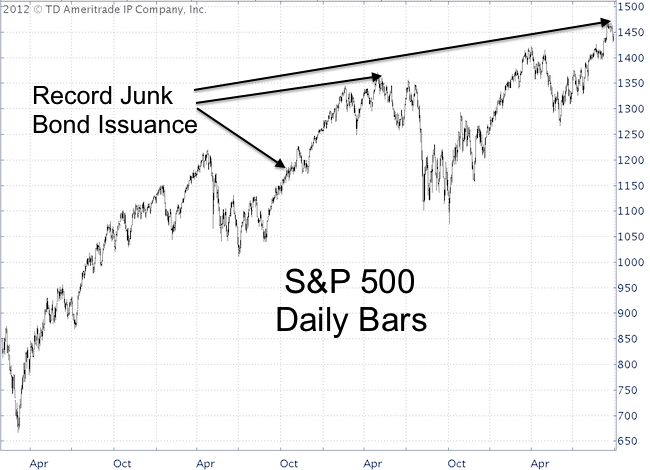 Another sentiment extreme can be seen in the high yield bond market, more appropriately called junk bonds. Companies just issued the third-highest amount of junk bonds. The prior records were set in October 2010 and May 2011. Those two dates are marked in the chart below. I’ll explain in a moment the significance of those two dates. Mutual fund managers tracked by the National Association of Active Investment Managers report that managers have a median exposure of 95% to equities. This is close to a six-year high and sets an 18-month record. The Dow Jones just went an entire quarter without losing more than 1%. Jason Goepfert with SentimenTrader took a look at what happens historically when the Dow goes an entire quarter without a 1% decline, while trading close to a 52-week high. There were 16 such instances since 1900. Over the next six months, the Dow was positive every time with a median return of +6%. Getting back to the two dates highlighted in the chart above, we are currently in a situation where sentiment is becoming extreme. But just as Advil covers up pain, QE3 tends to neutralize extreme optimism. Back in October 2010 it took several months before sentiment extremes caught up with stock prices. In May 2011 however, it resulted in a nasty sell off. From a seasonal perspective October is an interesting month. It has hosted a number of crashes but also a number of important lows. Looking at stocks, we see that the S&P 500 (S&P 500 SPDR – SPY) has been trading in a well-defined parallel trend channel. The strategy – as long as the S&P remains within this channel – is to sell when it reaches the top of the channel and buy at the bottom. Once the bottom (of the channel) falls out, it’s probably time to become more bearish. The Profit Radar Report monitors literally dozens of sentiment gauges, seasonal patterns, and technical developments to identify high probability investment opportunities for the best investment strategy. VIDEO: Will QE3 Drive Treasury Bonds to New All-Time Highs? Now that QE3 is here we have to talk about the elephant in the room; Treasury bond yields and Treasury bond prices. The purpose of QE3 and Operation Twist is to lower yields. Will it work and is there an investment opportunity? The Federal Reserve is buying Treasury bonds (more via Operation Twist than QE3). According to the law of supply and demand this should result in higher T-bond prices and lower yields. This video looks at the historic effect QE and Operation Twist had on 30-year Treasury prices (cause and effect) and identifies the next high probability trade set ups. ETFs that track long-term Treasuries are the iShares Barclays 20+ year Treasury ETF (TLT) and its double inverse cousin, the UltraShort 20+ year Treasury ProShares (TBT). Continuous analysis of long-term Treasuries is provided via the Profit Radar Report. >> Click here to watch video on Treasury bonds. Last Friday was triple witching and the week after triple witching is notoriously bearish. How bearish? The S&P 500 Index has closed down 22 out of 26 weeks since 1990 (82%) with average maximum losses about 5x as high as average maximum gains. Historically short sellers of stocks have an 82% chance of making money this week. However, the S&P 500 Index failed to registered a bearish price/RSI divergence at its September 14 recover high. 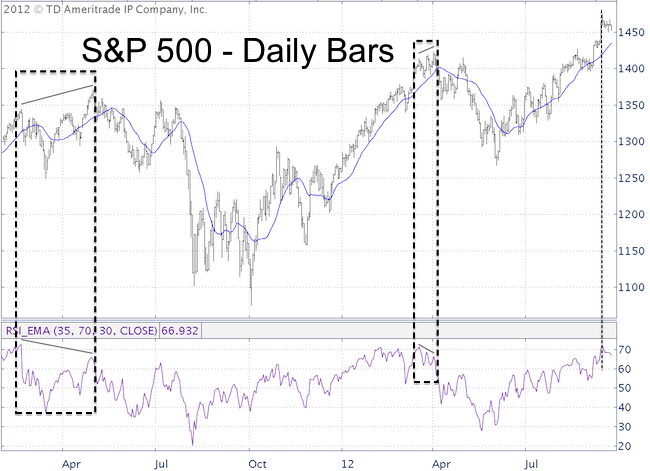 All recent highs that were followed by a decline of around 10% or more were foreshadowed by a bearish RSI divergence (I use a unique RSI setting to spot divergences – see chart below). So even a bearish outcome this week would likely be followed by higher prices later on. The purpose of the Profit Radar Report is to identify high probability trading opportunities. With the conflict between bullish technicals and bearish seasonality, there obviously is no high probability set up right now. 1) Prices decline to trend line support to present a possible buying opportunity. 2) Prices spike quickly to a new high accompanied by a bearish price/RSI divergence to set up a possible shorting opportunity. Non-leveraged ETFs that can be used to trade the above set up are the S&P 500 SPDR (SPY) and Short S&P 500 ProShares (SH). Leveraged options include the Ultra S&P 500 ProShares (SSO) and UltraShort S&P 500 ProShares (SDS). An early tip off to the next developing set up may be a developing triangle. A break out above or below triangle support/resistance should give us a measured target, which may quite possibly set up an even better opportunity than the actual triangle. Continuous updates and trading opportunities are provided via the Profit Radar Report. Will the Persistently Wrong Dow Theory Sell Signal Finally Come True? No other technical indicator has been around as long as the Dow Theory. Dow Theory started out more as an economic theory, which Charles Dow published in the Wall Street Journal around the turn of the 20th century. Dow’s theory focused on two key economic sectors: manufacturing (industrials) and transportation. If goods were being produced and moving through the economy, it should show up in the price action of the Dow Jones Industrial Average (DJIA) and Dow Jones Transportation Average (DJT). A strong economy would buoy both averages. The corresponding ETFs for the DJIA and DJT are the SPDR Dow Jones Diamonds (DIA) and SPDR Dow Jones Transportation Average (IYT). Despite a rather decent century long track record, the Dow Theory sell signal has been dead wrong for well over a year. Why is that, and will the sell signal finally kick in late September/October? 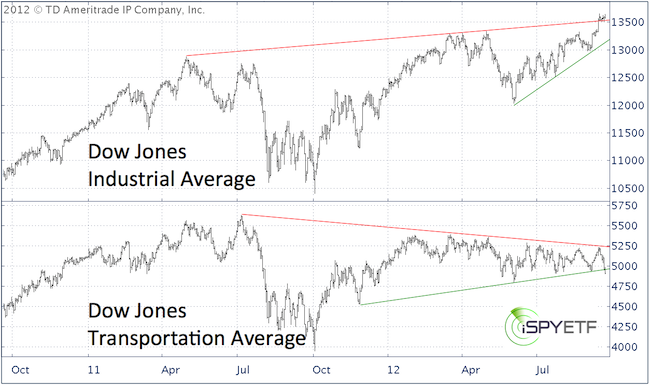 The chart below plots the Dow Jones Industrial Average (DJIA) against the Dow Jones Transportation Average (DJT). There are a number of bearish divergences, but none of them have hindered the DJIA from breaking to new recovery highs. The Dow’s trend is clearly up while the Transport’s trend is clearly down. The Dow is above resistance while the Transport is below support. Something’s gotta give, will the Dow break down or the DJT catch up? An examination of the historical significance of the current divergences doesn’t reveal a bearish bias. In fact, the performance of the Dow has been positive after instances where the Dow traded close to a 52-week high, while the DJT was nearly 10% below its 52-week high. October is also the beginning of a historically favorable season for the Transports (perhaps due to the upcoming holidays). However, the week after September triple witching and October in general, has a bearish bias for the Dow Industrials. As if the bearish divergence wasn’t enough, the DJIA is now above resistance. The DJT is below support. Technically it will take a move above what’s now resistance to unlock more bullish potential for the Transports, but historical performance and seasonality suggest the risk for Transports is limited. Exactly the opposite is true for the Dow Industrials. QE3 is here and the massive inflow of liquidity tends to buoy all asset classes including oil. High oil prices in turn cut into the profit margin of transportation companies like FedEx, UPS, Union Pacific, etc. FedEx has already cut its fiscal 2013 forecast. Chief Financial Officer Alan Graf blamed weak global economic conditions. But that’s old news and already priced into the Transports recent slide. It is obvious that the Transports refuse to confirm the Dow’s rosy picture, but the bearish omen hasn’t hurt the Dow’s performance either. I follow and respect Dow Theory, but have learned not to be dogmatic about any one single indicator. The Dow Theory sell signal will be right eventually, but the weight of evidence of technicals, seasonality, and sentiment suggests some weakness for stocks over the near-term followed by year-end strength. Simon Maierhofer shares his market analysis and points out high probability, low risk buy/sell recommendations via the Profit Radar Report. Click here for a free trial to Simon’s Profit Radar Report. On first glance the performance of the Dow Diamonds (DIA), S&P 500 SPDR (SPY) and Nasdaq QQQ (QQQ) seems to be closely correlated. This first glance assessment, however, couldn’t be farther from the truth. Here’s what separates the indexes from each other and why it’s important. Index investing or ETF index investing is a popular and low-cost way to put your dollars to work, it’s like putting your portfolio on cruise control. But driving on cruise control isn’t always the best way to get from A to B and doesn’t mean you won’t get into an accident. It merely means that you delegate speed control to your car. Your level of commitment to your own portfolio ultimately dictates your style of investing: buy and hold via indexes or ETFs, buy and hold via actively managed mutual funds, or a more active approach to buying and selling. Regardless of what type of investor you are, you need to be familiar with your investment vehicle(s) of choice, just like a driver needs to know the difference between automatic and stick shift. The S&P 500, Dow Jones, and Nasdaq are the most popular U.S. indexes and if you are an investor, odds are some of your money is invested in one or more of those three indexes. Equity indexes are often described as a basket of stocks. Retirees or near retirees are familiar with the term nest egg and the comforting picture of many golden eggs nested up to provide a comfortable retirement. But what if the basket of eggs is made up of one or two giant ostrich eggs that limit the space for other eggs? That wouldn’t be well diversified and one knock against the basket could scramble most of the retirement. Financial ostrich eggs among major U.S. indexes are more common than you think. IBM accounts for nearly 12% of the Dow Jones Industrial Average (DJIA or Dow Jones). Technically speaking, the DJIA is an average not an index. The DJIA is price weighted, in other words only the price of a stock matters, nothing else. IBM is the most expensive stock of the DJIA and moves the index (or average) 20x more than Bank of America (BAC) even though IBM has only about twice the market capitalization (the price per share multiplied by the amount of outstanding shares) of BAC. The ETF that best represents the DJIA is the SPDR Dow Jones Industrial Average ETF. Its ticker is DIA, that’s why it has the nickname Dow Diamonds ETF. The Nasdaq-100 and the PowerShares Nasdaq QQQ ETF (QQQ) hide another “ostrich egg,” – Apple. Apple accounts for a whopping 20% of the Nasdaq-100 Index. If you already own Apple or don’t believe Apple is the way to play technology, you may not want to own QQQ. The S&P 500 Index – represented by the S&P 500 SPDR (SPY) – provides more balanced diversification than the DJIA or Nasdaq-100. Apple, still the biggest player of the S&P 500, accounts for less than 5%. IBM has a weight of only 1.8%. Considering the different composition of the three indexes, it’s remarkable how closely their day-to-day moves correlate. 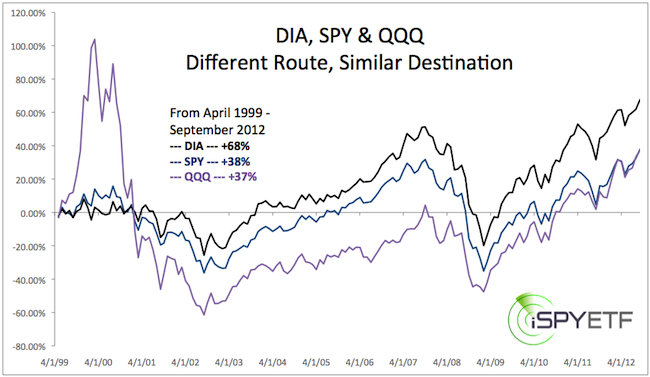 The chart below provides a visual of the long-term correlation between the Dow Diamonds (DIA), S&P SPDR (SPY), and QQQs. Illustrated is the percentage change since April 1999 (when the QQQs began trading) to provide an apples to apples comparison of the three indexes. The SPY and QQQ delivered a near identical return (+38%). The DIA is up 68% since April 1999. Of course the picture looks much different if you start measuring the return from the 2000 highs. All three indexes and index ETFs share the commonality of having had very sizeable swings ranging from -60% to +60%. The Profit Radar Report advocates an investment approach that capitalizes on larger up moves and turns neutral or short during major down moves. This approach can significantly enhance your return and reduce your exposure to risk. Retail investors have many choices to buy and sell stocks: Mutual funds and ETFs are just two of them. Regardless of the options, investors are often considered the “dumb money.” Is the dumb money really dumb? Wall Street geniuses and the financial media often consider retail investors the “dumb money.” That’s ironic, because Wall Street and the media are notorious for dishing out group think advice that’s getting many of the small guys burned. There’s plenty of data that shows that a plain index investing or index ETF investing approach (the real “dumb” buy and hold a basket of stocks approach) handily beats the returns achieved by Ivy League educated mutual fund managers that engage in actively buying and selling. If you’ve read my articles before you know that I like to pick on Wall Street and the financial media, but today we’ll talk about the investing prowess of retail investors – the “dumb money.” Is the dumb money really dumb? Is the Dumb Money Really Dumb? One of the best measures of retail investor’s appetite for stock is the asset allocation poll conducted by the American Association for Individual Investors (AAII). The chart below plots the S&P 500 Index (SPY) against investors’ portfolio allocation to stocks. Investors’ stock allocation pretty much waxes and wanes with the performance of the S&P and almost plots a mirror image of the S&P. Unfortunately, the cliché is true; retail investors buy when stocks are high and sell when stocks are low. I believe this is due to crowd behavior and the forces of investing peer pressure rather than stupidity, as the term dumb money implies. 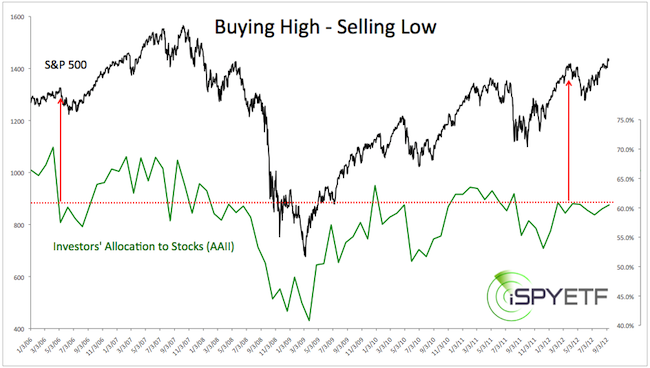 What else can we learn from this chart aside from the fact that retail investors tend to buy high and sell low? The average allocation to stocks since the inception of the survey in 1987 is 60.9% (dashed red line). The S&P currently trades near a 52-month high, yet investors’ allocation to stocks is below average (60.5% as of August). This is unusual. In fact, in the 21st century there’ve only been a couple of instances where investors’ stock allocation was below average when the S&P was near a 3+ year high. Those instances are marked with a red arrow. In August 2006 stocks went on to rally. In March 2012 stocks declined first and rallied later. The lesson for investors is A) not to follow the crowd and B) not to follow Wall Street or the financial media. The mission of the Profit Radar Report is to keep investors on the right side of the trade. A composition of indicators used identified the March 2009 and October 2011 lows as investable lows and got investors out of stocks at the 2010, 2011, and 2012 highs. What’s the profit margin on 2 million iPhones? Apple doesn’t reveal profit margins, but Reuters got hold of a document filed in Apple’s patent battle against Samsung. According to this document, Apple’s gross margin for U.S. iPhone sales between April 2010 and March 2012 ranged from 49 – 58%. The iPhone 5 sells for $199 – $399 (depending on built in storage). Let’s calculate a 58% profit margin on 2 million iPhones sold for $299. The result is $347 million. Since last Thursday’s unveiling of the new iPhone 5, Apple (AAPL) shares have risen 3.5%. This means that Apple’s market cap increased by some $24 billion. A $24 billion increase based on the news of 2 million pre-orders worth about $347 in gross profit doesn’t make sense. In fact, common sense and seasonality suggests that Apple is soon due for a reality check (a. k. a. lower prices). Since Apple is the MVP of the technology sector, it’s likely that the Nasdaq QQQ ETF (QQQ) and SPDR Technology ETF (XLK) will follow Apple’s direction.